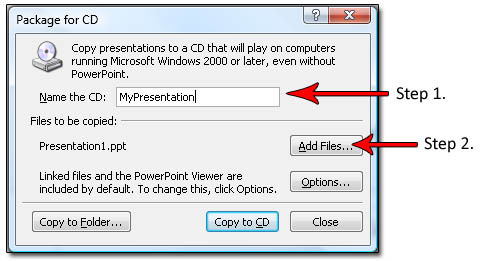 To Package a presentation for CD, follow these steps. 1. Firstly you want to name your CD preferably something short, easy to remember and related to the presentation that is being package. If you chose to go with Step 2. Select the files to be added. This will open a new window. This window shows all the presentation to be added and also in what order that they will played in. This can be re -ordered by clicking the up and down arrows. 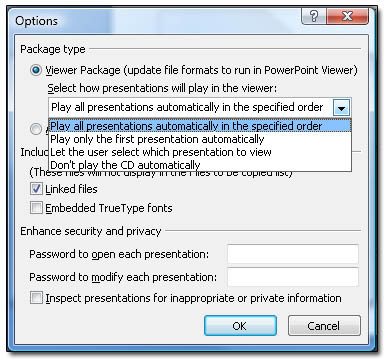 The viewer Package refers to the PowerPoint Viewer that will be included when the presentation gets packaged. 1. Play all presentations automatically in the specified order. When the CD is inserted into the computer. The presentation will be played automatically and in the order specified earlier. 2. Play only the first presentation automatically. The first presentation on the list will be played only. The other presentations will only be played when selected by the user. 3. Let the user select which presentation to view. 4. Don’t play the CD automatically. 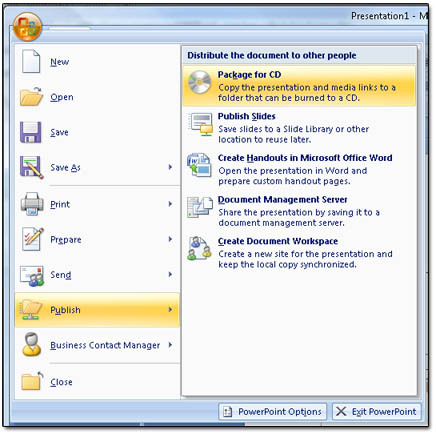 Normally when the CD is inserted, the presentation will play automatically however in this case the user will have to access the CD manually and launch the presentation. There is also an option to protect the privacy of the presentation by adding a password. When a user attempts to open the presentation a password will be required otherwise the presentation will not launch. After the presentation has been launch, If the user attempts to change an aspect of the presentation such as content or graphics a password will be required. 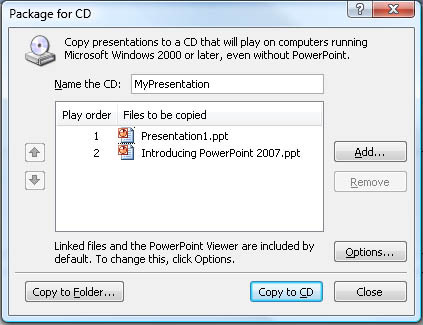 And that’s everything you need to know about Packaging a Presentation for CD in PowerPoint 2007!